Free Fishing Reports > Northeast > New York > Western Sound > Chunk Bite is on Fire! Chunk Bite is on Fire! Howard Zodicoff’s group had a late start but really made up for it in a short amount of time. The bite was a little slow for the first 30 minutes but after making a quick move to better bottom and the tide picking up the fishing was absolutely non-stop, with plenty of doubles all on LIGHT TACKLE! We’ve been absolutely crushing the fish with Capt Mikes light tackle and the clients have loved every minute of fighting fish with gear this light. 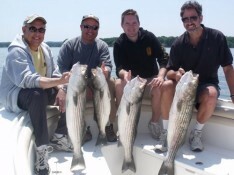 We still have some spots open for next week and the fishing has been getting better each day. We are seeing more signs of the bluefish moving in which will help the bass begin to feed even more aggressively and heighten the chunk bite.